One of the biggest pitfalls to budgeting is impulse buying, which results in a temporary moment of satisfaction but often can be followed by guilt and disappointment. I put my hand up. Yep, I do it… a new outfit always makes me feel good. I mentioned in my initial post announcing the family money saving budget tips series that I have a serious addiction to purchasing new quilts for the beds in our home. Changing up a room and giving it a fresh new feel is just something that makes me happy. However, the quilts I had on the beds were perfectly fine and didn’t need replacing, so I had to learn to moderate my purchases and not buy on impulse (see, I didn’t say not buy at all… the key is moderation and budgeting for the spend). Throughout my childhood I only ever had 2 quilts for my bed so I think this is my trigger, buying because I can. But I don’t need to. When I see one I like, I have learnt to stop and remember I DON’T NEED IT. I’ve shared some tips below to help you if you are prone to impulse buying. Impulse buying is a spur of the moment decision to buy immediately before a purchase is made with minimum to no planning involved. There are a number of factors that contribute to why we impulse spend. Some feel a huge amount of immediate pleasure when they make a purchase, others get sucked into sales or are persuaded by particular circumstances, such as the people they are with or if they’re on a holiday. Many engage in spontaneous spending depending on the mood they are in – if they’re feeling sad, they will buy to lift their spirits or if they’re happy, they will buy to self-indulge. Credit cards and seeing a huge amount of money in an account can also trigger impulse buying. It becomes a problem when we end up spending money on things that we don’t really need or if we exceed our budget. Serious and frequent cases of impulse spending can lead to debt, unhappiness, and regret. It’s important to separate our needs from our wants. 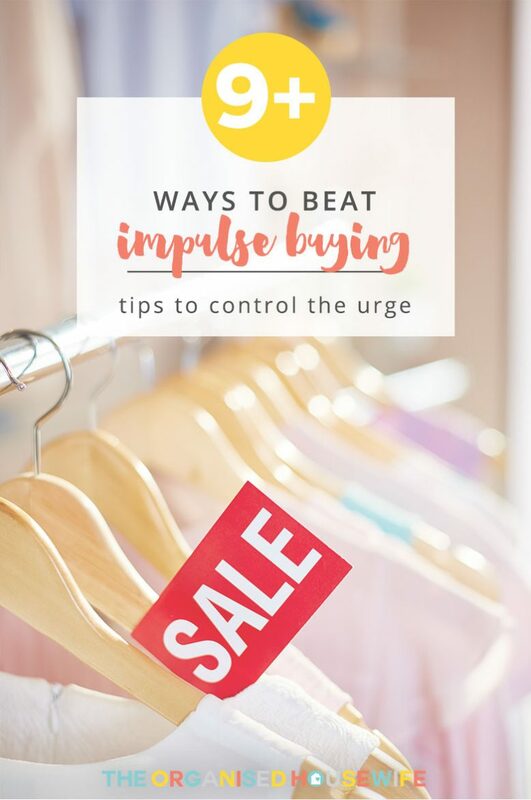 Here are my 9+ ways to Beat Impulse Buying. Remember it’s all about control and moderation. Ask yourself, have I budgeted for this spend? Are you guilty of impulse buying? Katrina, you’re so right! Online shopping is almost invisible shopping that it becomes difficult to realise that you just bought something that you really don’t need which you would have if you were shopping physically at the stores. 1) Don’t go “shopping” as a means of entertainment. Browsing around the shops, you are bound to see something you want. If you’re not there – you won’t be tempted. If you’re bored – find something else to do. I only ever go to the shops with the express purpose of buying something I need. 2) Unless you have a list of things you NEED – put all junk mail / catalogues in the bin – same theory as in (1) above. 3) UNSUBSCRIBE from as many email companies as you can – same theory. 4) Do a major declutter at home and look at all the stuff you’re getting rid of. Take a mental picture and bring that picture to your mind when you are tempted to buy something you really don’t need. Ask yourself if you’ll likely be decluttering that particular item at some stage in the not too distant future. 5) Think of the alternative uses for that money. Are you better off spending $50 on a new top or putting that $50 away for school fees / bills / a holiday ? 6) Short term gain can lead to long term pain. They are great tips, thanks Julia! It is way too easy to head to the shops when you don’t have anything to do to just ‘look around’, it’s DANGEROUS!! I like tip number 5 too. It can be fun buying something at the time, but you really have to prioritise and think if the money can go towards something more important instead.